Julia was convinced fitness models had elite genes before she walked in their shoes. See how this mother put herself first and started a fitness journey full of twists and turns! I've always been the person who tried to help and impress everyone before myself. As a result, I became completely out of shape, down, angry, and embarrassed about how I looked. I became an emotional eater to deal with issues and cope with stress. After having two beautiful children, I suffered from what I believe to be postpartum depression. Before I decided to make this life change, I was hanging onto an on-and-off seven-year relationship. I can look back on it today and realize it was going absolutely nowhere. As the years passed, we learned how to bring each other down more than we learned to love each other. I remember envying cover girls on fitness magazines while waiting in line at the checkout to purchase groceries. I was convinced they were part of some elite genetic community. One day, I decided enough was enough. Like a light switch, I decided to change my life and be healthy. I weighed a whopping 174 pounds and held 34 percent body fat. At 5-foot-1, I was considered obese. Up until that point, I was in denial about my health. That day was September 1, 2010. The beginning to any life-changing journey is never easy. The effort to get started and keep going during the first few weeks was difficult because I battled my own negativity. After a few months of hard work, people started noticing and my failing relationship ended once and for all. Putting myself first, exercising, and watching what I ate gave me time to reflect on areas that went wrong in my life. I discovered how to love myself. Within a year of this lifestyle change, I gained loads of confidence and learned to appreciate the little things. The decision to compete in figure came after eyeballing an event for nearly a year. I knew exactly which organization I wanted to participate in: International Drug-Free Athletics. I told close friends about my goal. Some were supportive and others weren't, but I forged ahead, lost friends, and gained new friends. The training and diet preparation was one of the most difficult yet rewarding journeys to date. Going through with it and reaching the end was an accomplishment I never fathomed I could reach. I embedded a "no excuses" mentality into my brain and it showed. I couldn't get to a gym, let alone afford a personal trainer, so I got creative. I started running up and down my staircase at home and performed simple exercises using my own bodyweight after my children went to bed. I watched what I ate and cut out sugary drinks. Within three months, after accomplishing a 3000-stair climb, I lost 21 pounds. I was pumped and continued stair-climbing and bodyweight exercises for two more months. 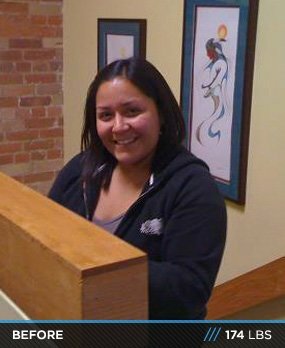 By January 2011, I lost 32 pounds and started getting nervous about gaining the weight back—it had happened before. Despite losing weight, I knew something was missing: clean eating and strength training. I was hesitant to pick up the weights and the thought of using protein powder freaked me out, but I put faith in the concept and off I went with nothing to lose. By May 2011, I lost 54 pounds. There were many days I felt like giving up, but I kept my "no excuse" attitude. I researched successful females like Tosca Reno, Erin Stern, and Kim Dolan Leto. I followed their stories, their past, and their training and eating habits. It became a daily regimen to spend at least one hour per day reading about successful women in the fitness industry. I searched the Internet like a fitness fiend, soaking up whatever information I could about clean eating and fitness. I watched inspirational YouTube videos about fitness, and overcoming obstacles—whatever I could get my hands related to fitness. Most important to me throughout the process were my children. I wanted them to have a positive role model who exemplified a healthy lifestyle. It's my hope that they will remember me as a healthy, happy, and fit mom. I eat every three hours, drink one-and-a-half gallons of water per day, and drink 2-3 large mugs of green tea per day. The diet was the most challenging. It's probably the easiest part to follow because you're using a "back to the basics" approach with your food, but it's the temptation from the outside world that is challenging. As you delve into this lifestyle, you realize how bad people are at eating and how uneducated we are about healthy eating. Despite knowing this, bad food is tempting once in a while. I became a certified personal trainer halfway through my journey. 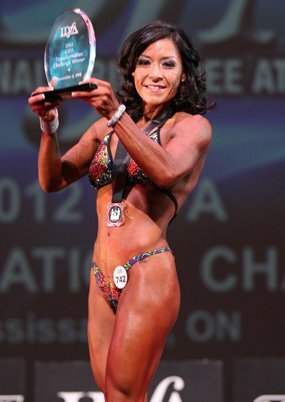 I entered, competed in, and won my first figure competition, the IDFA Transformation Challenge. I was the IDFA Short Novice Figure winner and IDFA Overall Figure winner. I started my own training business for online and in-home services. I'm also becoming a figure competition coach. My future fitness plans are to keep motivating and helping women realize their potential. In order to be happy they need to put themselves first, which involves taking care of their health. When you're happy, healthy, and fit, everything around you changes and you gain the confidence and emotional well being that you deserve. Write positive notes and leave them randomly throughout your house. Create a vision wall of your goals. If you cheat, so what. Get back on track. Keep and find friends who are supportive. No excuses. This is your life and you come first. Bodybuilding.com is a major part of my journey. I reference it to find answers about supplementation, protein-based recipes, exercises, and motivation. The articles are always a great read and the transformations are so inspiring.